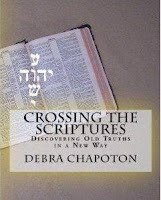 It was an amazing experience to discover the dynamic connections between the ancient Hebrew letters and the individual books of the Bible. There are several excerpts (I labeled them "snippets") from various chapters of CROSSING THE SCRIPTURES that I have posted here in weeks past. I can think of a few people to send a copy to who have never read the Bible - they'll get a good concept of the whole Bible in a short time. I've also had several people who know the Bible well read it and tell me how interesting and enlightening it was to read (and reread) CROSSING THE SCRIPTURES. So . . . I guess it's for everyone. Paranormal . . . Romance?